I absolutely love to read. My favorite thing in the whole world is my precious Kindle. It is loaded with hundreds of books that I use to escape for just a little while every night before bed. I have moved on from teenage vampires, but I do still enjoy a good love story. And I don’t have a nursing baby to use as an excuse to have a quiet time to read. However, I do read for about an hour every night before bed. It is part of my Steph Time. Time just for me. This Spring I discovered a new author at the recommendation of my friend, Tara. It is an Austrailian author named, Liane Moriarty. Her first book that I read was The Husband’s Secret. There are a lot of things I like about it. It is told from different points of view. There are a few different story lines that run parallel and you aren’t quite sure how or when they will intersect. It is also so witty and will make you laugh…and even cry much to my chagrin. But the thing I love the most of the book is the way it ends. Don’t worry I am not going to give anything away! 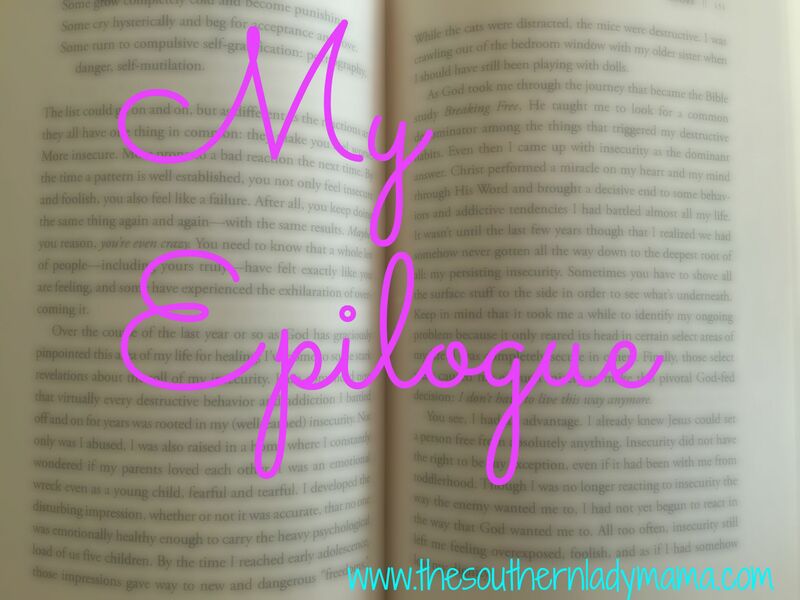 It truly is one of my favorite Epilogues I have ever read. Instead of wrapping everything up real quick in a red bow with a wedding and/or a child born, it starts like this…. Moriarty then proceeds to go through each of the characters and details how one changed choice or slightly altered circumstance could have drastically changed the outcome of their life and other people’s too. And we’ll never know. Wow. Just Wow. Have you ever thought about that? What tragedy have we narrowly missed, yet we don’t even know it? Or conversely, what blessings have vanished before we even know of their possibility? The car accident that was avoided because you lost your keys and were running 10 minutes late. The breathtaking sunset you missed with your family because you were too busy trying to take the perfect family photo. When I think about my life and Epilogue, I take comfort that someday all of those secrets will be brought to light. I often talk to my children about how wonderful Heaven will be. Usually it is after that have asked me a particularly difficult question, and I quickly refer them to Jesus. “Ask Him in Heaven! He will tell you!” Oh how busy they will keep Him! All joking aside, I do believe that we will be able to learn about things that we never could comprehend during our time here on Earth. One time during my life that I really want to have a heart to heart with Jesus about is in 2013. It was when my husband, Eric, and I were going through fertility treatments. We had been extremely prayerful about each decision we made along the way, so we were confident we were in God’s will for our family. We had been cautiously optimistic that we were going to get pregnant. Why not? It was the direction that God was leading us, right? Even so, it was a long, hard, tear filled year for me. After the second round of failed IVF and a surgery that left me without my fallopian tubes, the nail was in the proverbial coffin. The babies that I had loved and rocked in my dreams would never be. Why had God led us down this road only to be heartbroken? I had never thought about that. What if I had gotten pregnant but it had ended in a miscarriage? Did God save me from that pain? Or the book that I have written about my battle with Infertility…I never would have felt led to share my story if I had a different ending. How many people am I helping by sharing my story? The horrible surgery I had to remove my fallopian tubes. Could that impact my health down the road? There are some studies that it reduces the risk of Ovarian Cancer. Could that have saved me for the children I have been blessed with? The bottom line is that I can’t know the answers to everything this side of Heaven. I have to trust that God has written the best story for my life. He is the Author of my story. And I look forward to my book club with Him when I finally get to read my Epilogue. « Sunday I Was Overwhelmed. Friday I am FREE. What a happy day that will be! I have a few questions myself!